Ted found this 1989 Plymouth Fury at a local garage in North Haven, Connecticut. "Mechanically, it was in bad shape" said Ted. "The car didn't run, and there was no Title to be had. A lot of parts were missing on the car along with it having a bad vehicle computer" according to Ted. A parts car was bought for five hundred dollars and the restoration began. Ted told us that the car only cost him approximately $2500 and one year's time to get it into the shape you see above. He acquired a lot of police equipment items from his own department where he has served the Town of North Haven as a Police Officer for 23 years. "We had the Police graphics left over at the town's garage", Ted explained. The Police Department had ordered hundreds of the Police graphics back in the 80's and miraculously, they still had a few left. Ted's attention to detail is second to none with this car. Options include a period correct working two-way, a Radar unit that is also from the 80's, along with a prisoner cage and a rack for his shotgun. 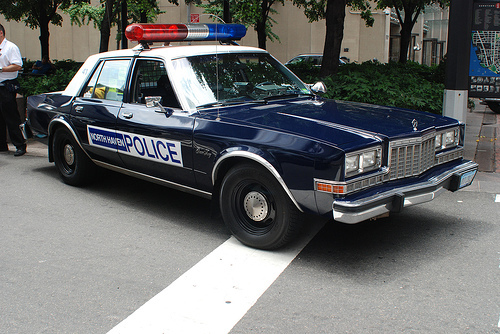 The car was originally purchased and used by the Enfield Police Department in Connecticut as a Traffic unit. Ted also noted that "Traffic Units don't normally suffer the abuse the way the department squad cars do, and the body was in fairly good shape". We agree with Ted's assessment. The car is period correct from its Over-heads right down to the fleet dish wheel covers. This car is no trailer queen either. Ted travels up and down the East coast showing it off at as many car shows and police venues as he can schedule. Great job Ted. For more on Chrysler's Plymouth Fury: Click here.